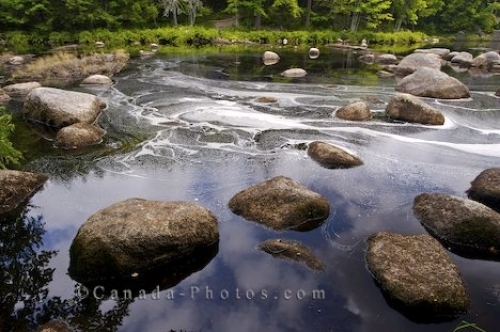 The water at Mills Falls along the Mersey River in Kejimkujik National Park in Nova Scotia, Canada swirls around the large boulders on its way down. The scenery on either side of the river consists of old hemlock trees towering above the Mersey River and nature paths through the wilderness of the park. Kayakers traveling along the Mersey River exploring the scenery of Kejimkujik National Park, find themselves disembarking at various points where they must take to the trails. Tranquility surrounds the area around Mills Falls except for the sounds of the rushing water and the calls of the wildlife. Boulders in the Mersey River at Mill Falls in Kejimkujik National Park and National Historic Site of Canada, Kejimkujik Scenic Drive, Highway 8, Nova Scotia, Canada. Picture of the scenery at Mills Falls along the Mersey River in Kejimkujik National Park in Nova Scotia, Canada.